Chennai Super Kings announced themselves in style in their new home as they defeated Rajasthan Royals by a thumping 64 runs on Friday. The Whistlepodu Express showed that no matter the venue the performance will never change. With Pune being declared as the new home stadium of CSK for the remainder of the season after security concerns in Chennai, there were apprehensions about whether CSK would be able to replicate the same performance in Pune as those shown by them in Chennai this season. They ended up proving their doubters wrong after a vintage all-around performance by Shane Watson saw them trounce Rajasthan Royals. With this fixture being played after a gap of two years, viewers from around the world tuned in to see how the now resumed rivalry would pan out. Much to the disappointment of all, it turned out to be a pretty one-sided match, one which saw RR fail miserably with both the bat and ball. In a fine showing by Shane Watson who proved that class is permanent and form temporary, the outfit from Chennai ended up taking the bragging rights comfortably. Out to set the target, CSK started their innings in grand style with their openers smashing the ball all around the park in the powerplay overs. Winning the toss failed to be of any advantage to the Rajasthan side that have now lost back to back matches. Wrong picks in the IPL auction are now coming to bite the side in the back that is now day by day looking the weakest side in this year’s IPL. With their bowling showing no intent against CSK, Watson got a chance to fully express himself which he grabbed with both hands. The all-rounder scored the second century of this season as his 106 off 57 balls took his side to 204-5 off their allotted overs. Set an uphill task, Rajasthan Royals lost Ajinkya Rahane, Sanju Samson and Heinrich Klaasen inside five overs to end the match for them right there and then. 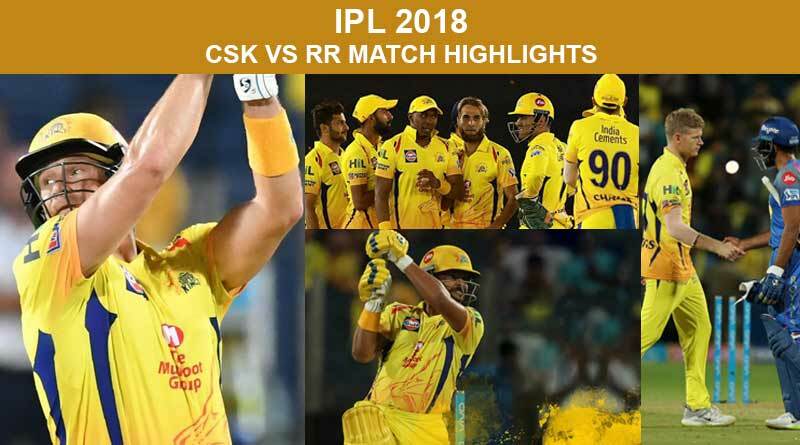 If you liked the CSK vs RR Match highlights, stay tuned for the next match highlights.